When your car is disabled, and you need a wrecker service, call us at Newway Towing. We have been serving the areas of San Rafael for several years, and we take pride in providing the best roadside assistance and towing services that you can trust. With 24/7 availability and fast response time, you can get help right away and have your car removed and pulled carefully. We understand that being involved in an accident or experiencing a car breakdown can be very stressful, but if you let us do the work, we promise to deliver the highest standard of services. The techs we cooperate with will provide you with just the type of service you hope to get and all for a price that’s hard to beat. As a local company in San Rafael with years of experience in the industry, we believe that the best way to help the drivers is to follow the highest standards of roadside assistance and wrecker services. No matter what the vehicle problem is, we make sure that it will be fixed efficiently. Our towing experts and drivers are all licensed, bonded, and insured. They are also honest and friendly individuals who will ensure your safety and will get you back on the road as soon as possible. These people can handle different types of vehicle concerns regardless of its models, sizes, and manufacturers. We train them with the latest technology so they can provide the best wrecker service experience for our clients who need it the most. Moreover, our company is also fully equipped with tow trucks, tools, and equipment for transporting any kinds of vehicle. You can be confident that the right people will handle your valuable car because we have the best people and the most advanced materials to make the wrecker service effective as possible. All kinds of vehicle problems including accidents, flat tire, out of gas, and engine malfunction happen without notice. Although we can perform preventive measures to avoid untoward issues, a lot of the drivers are still experiencing such dilemma at times when they least expect it. 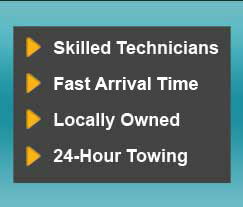 So to cater the needs of vehicle owners in San Rafael, Newway Towing can be reached around the clock. Our roadside assistance and wrecker services are available 24 hours a day in 7 days a week, and we also guarantee a fast response time. Whether you call us at night or early in the morning, we can send our team of expert professionals to have your car towed to its desired location. We always aim to make a difference to the community, especially to the vehicle owners in San Rafael. We make it a point to provide high-quality wrecker services at a reasonable price with no hidden charges. We are dedicated towards excellent customer service, and part of that is our honesty and reliability. Whenever you call us for help, we guarantee that you pay the most reasonable amount of the best quality. Call us now at Newway Towing!